A legendary disbanded company reformed. 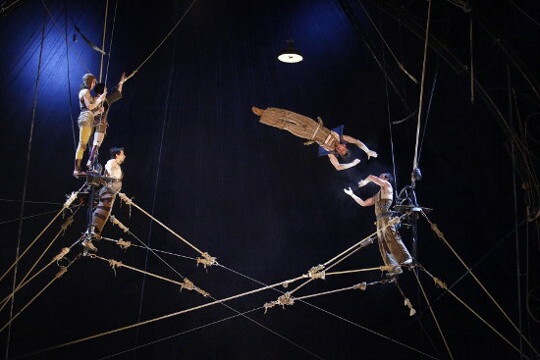 CirkVOST is made up of members of the old, dismantled Les Arts Sauts, the French company who in the 1990s did so much to push forward the art of flying trapeze, introducing theatrical and dramatic effects and innovations in rigging. For their first production, Epicycle, CirkVOST chose to switch their primary discipline to Korean cradle, building a giant, circular portal-like rig that framed the airborne performers at its centre. Unquestionably CirkVOST have an excellent wheel. Built from dark metal, two towering rings are joined by an intricate tangled network of ropes, pulleys and looping bars. Old hanging lights cast their glow in the centre; a dark plane of netting stretches the bottom.